Let’s not waste any time getting to the point of this week’s episode of The Walking Dead (ironically titled “Indifference”). 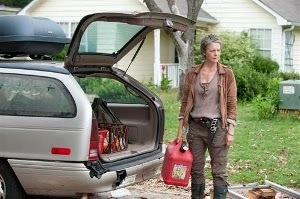 Rick (Andrew Lincoln) cast Carol (Melissa McBride) out fearing she has become too dangerous to be around his children. So the burning question is did he do the right thing? I don’t think there is a simple answer to that. I don’t like what she did, but I’d rather have someone who will fight to save lives than risk lives over a bottle of booze. 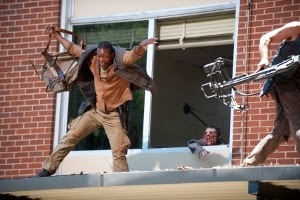 I’m of course talking about Bob (Lawrence Gilliard Jr.) who stopped at nothing to keep walkers from grabbing his backpack full of whiskey. While Daryl (Norman Reedus) threatened to kill Bob if he ever pulled a stunt like that again, they didn’t abandon him to his own fate. I liked the parallel, though I disagreed with the outcome of both situations. Not that I think they should have done it any differently in terms of the storytelling. Carol was on her way to becoming the new Shane (Jon Bernthal) – in terms of creating a power struggle – and Rick wasn’t going to take any chances, fair or not. Why Daryl and the others saved Bob was basic human decency. Daryl, Michonne (Danai Gurira) and Tyreese (Chad L. Coleman) are probably the toughest, and most angry, characters on the show, yet they weren’t ready to let someone die of their own stupidity. So why would Rick – the man sworn to “keep everyone safe” – so coldheartedly cast someone out who has been with them since the beginning. Because she has become what he fears Carl (Chandler Riggs) will become – someone who sees basic survival as their only objective. The group as a whole is only as strong as its weakest link. So the group is only useful when it is strong, otherwise it is a threat. That is what Carol’s viewpoint has become, and I can’t say that I completely disagree, as distasteful as her actions were. So to answer the basic question – I don’t think Rick did the right thing. He cast out an asset because he fears his own weakness could be his undoing. I’m assuming, and hoping, we will see Carol again. I’m sure Daryl won’t be too happy with Rick’s decision. I hope he isn’t. Daryl has become kind of a boring character. He could definitely use some friction with someone. I think Carol was one of the reasons he went back to the group instead of going off with Merle (Michael Rooker), so he might not think losing his brother was worth it now that she is gone. We’ll soon see where this is all going, but hopefully they pick up the pacing a bit.